Undercover Mother: Share the Love: $50 Tiny Prints Giveaway! Share the Love: $50 Tiny Prints Giveaway! For Christmas cards, we love ordering from Tiny Prints simply because the designs are beautiful and the product is always high quality! There's just one tiny problem I have when it comes to placing my Tiny Prints orders: how on Earth do we choose just one card with some many lovely designs to choose from?! This year, I'm loving two different cards especially, and I'm having a hard time choosing. Which would you rather get in your mailbox? Help me decide, and there might be something else in your mailbox before Christmas! 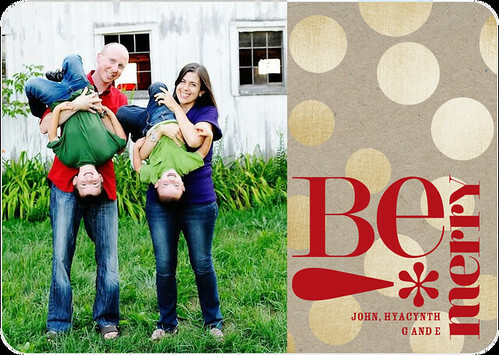 Tiny Prints is giving one person $50 off her Christmas Card order! Simply leave a comment with which card you'd choose if you were me, and you'll automatically be entered into the drawing! And then maybe head over to Tiny Prints and start eyeing up which Christmas Cards you would choose and maybe check out some other special coupons! Giveaway ends at 9 p.m. tonight, November 19, 2012. Also, thanks for helping me make our Christmas Card decision! This is a sponsored post from Tiny Prints. All opinions are mine; Tiny Prints is gifting me with some Christmas Cards of my own in exchange for spreading the love about Tiny Prints. I am torn! I love the soft one with the close up of all of you...but love the idea of goofy too with the bright and your family's goofy pose. With that said I think you might choose the soft and classic! Colorful and bright for sure! Both are beautiful! I think I would choose soft and classic. I feel like the classic one is a family photo that I could frame afterwards. I like the classic...I'm such a fan of black and white portraits!! colorful and bright for me! both are lovely - but #1's cheeriness seems to fit you and your boys the best! I think you should go for the colorful and bright! I love that picture of the 4 of you! I like the Colorful one. The caption and the photo go so well together. The first one! LOVE that design. I like the first! The second is more classic, but the first is more original! Both are wonderful, but for a Christmas card I prefer the "soft and classic." Soft & classic...something about those smiles. :) PS we love tiny prints too! soft and classic, for sure! Colorful and bright! It emulates your family very well. Soft and classic - great portrait shot! Hi !!! They are both Awesome but the 2nd choice is my Fav !! 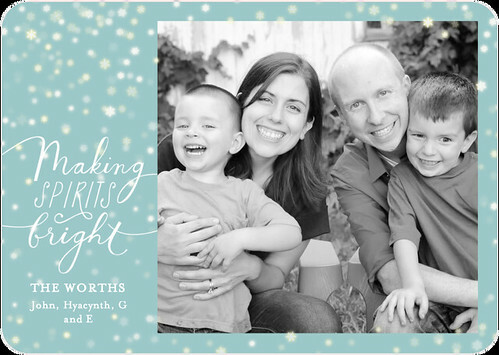 We order from Shutterfly,tinyprints or Treat.com personalized cards are So Wonderful to give and to get !!!! Thx again for a Wonderful Visit today -Ace loves you all !! Happy Thanksgiving Worth Fam !!!!! !